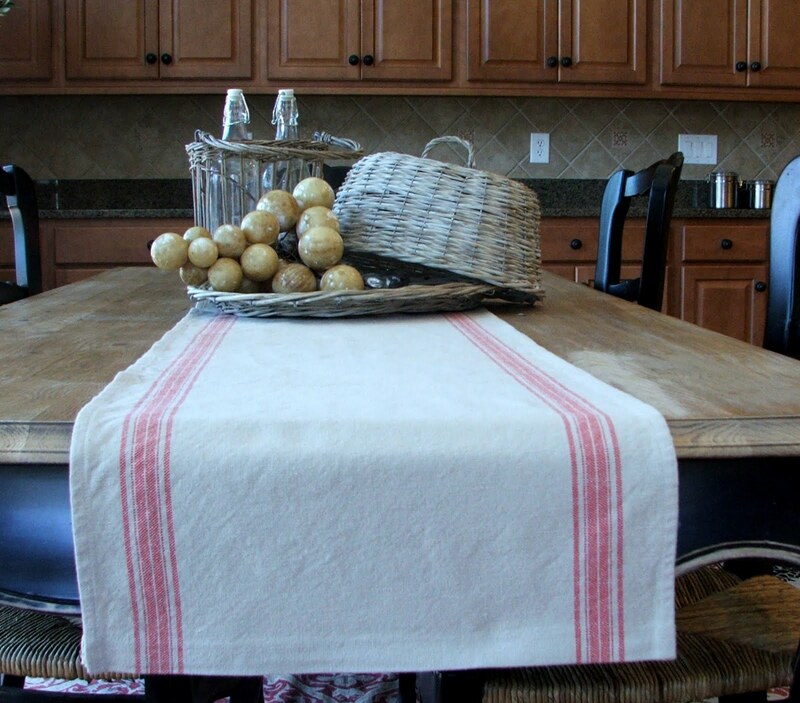 A while back I was reading a post from Kathy at ﻿Creative Home Expressions about a runner she made out of toweling purchased from Fabric.com. I loved the fabric and I especially loved that this could be a no sew project. I may not know how to sew but I can use an iron! The toweling fabric is already finished on both sides so all you have to do is hem the ends or in my case use iron on hemming tape. This was such an easy project and took less than five minutes to complete. went from painted white to gray in this post. I will be hosting Summer Entertaining on June 23 so get your Summer recipes and tablescapes ready to link up. Visit At The Picket Fence for more details about the party. I truly appreciate your visits and I love reading your comments. I have not seen this fabric. What a great idea. Love it. Love that toweling, it looks great as a runner. The food cover and tray are so gorgeous as are those grapes. but where is your "ruffly goodness"? Love the fabric Sherry. Please give me some more information about the fabric like what fabric.com calls it as I would love to purchase some. Loving your blog and the name says it all, I am your newest follower. Found you on French Country Cottage. I love fabric.com! Your runner looks so country chic Sherry! As does the stuff you put on the table. Thanks for the mention and link, Sherry! Great idea to hem it with the iron on tape! I love your new runner! Thanks for the info about the fabric source! 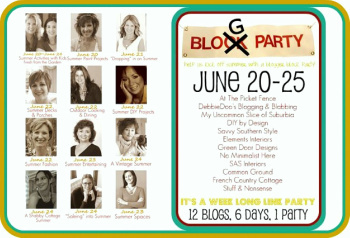 I'll be joing you for the blog party… what fun! I love it..What a great idea..I am off to fabric.com..haha..Have a great week-end.. This is my type of project!! LOVE your runner! I was in MI a couple of weeks ago visiting and found the same fabric, but with blue stripes.. yep, a few yards of this came home with me!! What great fabric, Sherry. I must have missed Kathy's post. It's a lot of look for not a lot of work. Hi Sherry…I have seen this at Fabric.com but never ordered any. I really need to because it looks incredible! There is a shop on eBay that sells vintage toweling at about 50.00 a yard. It's awesome but not worth that price! I do love to look at it though…hope you have a great week. Sherry, just got your message and have already added your name and link to my sidebar participant's list! I'm so glad you are going to join us Friday for the Wedding Party!! I'm so excited to see what everyone will share! And thanks for being such a sweetheart to add my party button to your sidebar to help spread the news! BTW, I love your no-sew runner!! I love this… it's so, so charming! Good job and great idea! A lovely table top! 🙂 I want one of those table runners… I'm off to check out Fabric.com. So very pretty. I am looking so forward to the blog party! You are just too clever my friend! I adore it and I love that it is "no sew"! Thanks for sharing it with us at Inspiration Friday! We're sharing the link on our Facebook Page. Can't wait for the party!! 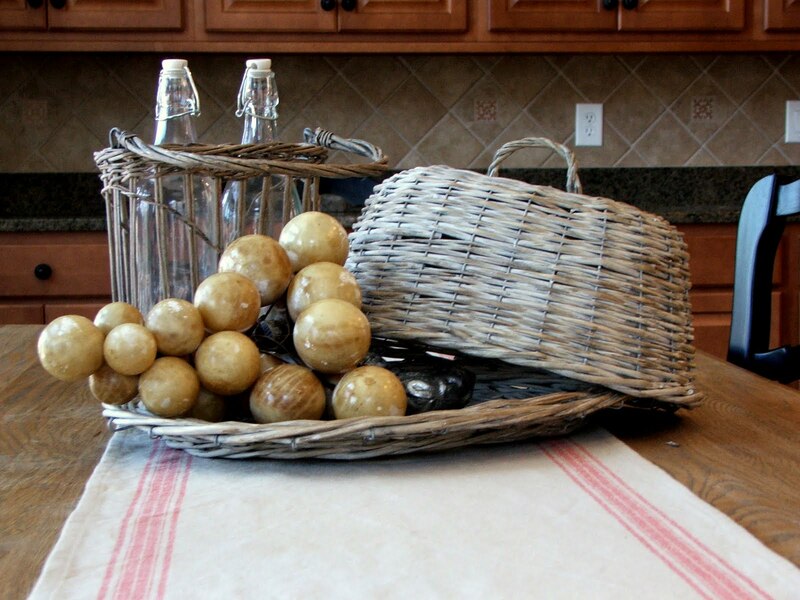 Lovin' the french farmstyle look! Hi Sherry! I'm one of the multitudes that want to buy some of that fabric, but can't find it at Fabric.com. What keyword did you use? Thanks for the great tutorial and the great idea, girlie! Visiting from the Freckled Laundry link party. I have admired this fabric for a while on fabric.com, but never bought it because I couldn't picture myself making a bunch of small towels. This is a great project and I can find five minutes in my busy day to make one for myself! Thanks for the inspiration!